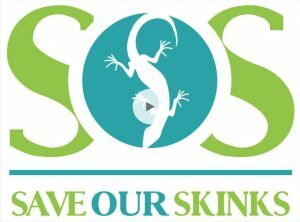 Local environment group First Friends of Dandenong Creek have a vision to protect vulnerable skinks, and they’ve launched the ‘Save Our Skinks’ crowd-funding campaign to make it happen. In Melbourne’s East, the Swamp Skink (Lissolepis coventryi) and the Glossy Grass Skink (Pseudemoia rawlinsoni) are under significant threat due to the impacts on their habitat through rapid urbanisation, the draining of wetlands and polluting of waterways and changes in climate. Over the last few decades, survey efforts have recorded declining numbers of these skinks. If the group is successful, bushland reserves along the Dandenong Creek from Bayswater to Vermont will be surveyed by dedicated citizen scientists to ascertain current populations of these skinks. The SOS Survey will involve grid arrangements of concrete roof tiles throughout various bushland reserves, surveyed regularly throughout Spring and early Summer by community volunteers and under the guidance of an authorised faunal survey expert. The SOS Survey data will inform the project’s next stage of revegetation and habitat enhancement. The SOS Campaign is the effort of First Friends of Dandenong Creek to enlist community support for these vulnerable and valuable species and those dependent on them. Please visit their crowd-funding campaign page to watch the video and find out how you can help support this wonderful project. The campaign runs until the end of October.